Don’t try to make individual drinks for each visitor. Instead, mix up a big batch of of cocktail pro A.J. Rathbun’s favorites and then bottle them, which you can do anytime from a couple of hours to a couple of days before the party starts. Then, when it’s time to imbibe, you can join the fun. And not only are bottled cocktails a boon when you’re throwing a party, they also make fantastic host/hostess gifts when you’re going to a party. Flip-top (sometimes called swing-top) bottles are ideal for pre-made batches and can be found in beer-making supply stores, such as The Cellar Homebrew (Greenwood, 14320 Greenwood Ave. N; cellar-homebrew.com), as well as Cost Plus World Market (Belltown, 2103 Western Ave.; worldmarket.com) and online at Amazon.com. Note: If you follow your own favorite cocktail recipe, avoid carbonated ingredients. 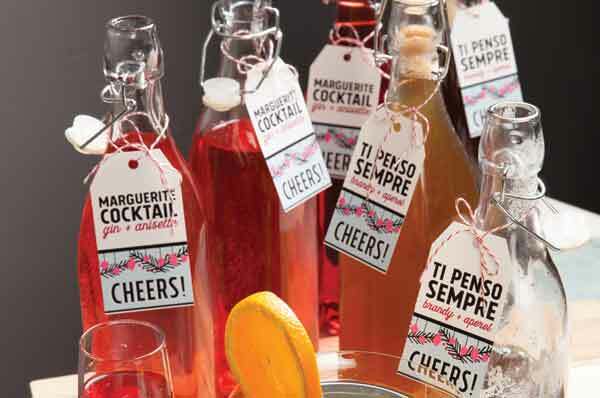 String red and white twine through drink labels and have guests pick their poison. 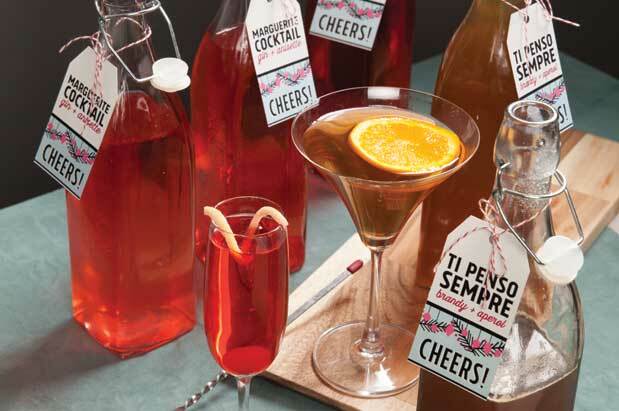 The citrusy brandy- and Aperol-based Ti Penso Sempre is Italian for “I think of you always”—a perfect sentiment for holiday soirées with people you adore but don’t see often. The gin-and-spice Marguerite cocktail has been served at parties since the early 1900s and makes a lovely addition to any holiday gathering. Get the recipes for “bottled cocktails” here. Forget veggie trays or chips and salsa. The vast array of grab-and-go and easy-to-plate dishes available from area Metropolitan Market stores (multiple locations, including Lower Queen Anne, West Seattle, Sand Point; metropolitan-market.com) may not entirely fool party guests into thinking you’ve slaved for days, but they’ll merrily play along. Build the ultimate fruit and cheese platter with Boat Street Kitchen’s balsamic-pickled Black Mission figs ($9.99/jar), set out alongside the Savannah Bee Company’s raw honeycomb ($22.99), dried orange cranberries ($7.99/pound), shelled pistachios ($24.99/pound) and Metropolitan Market’s signature baked Brie in brioche ($13.99). 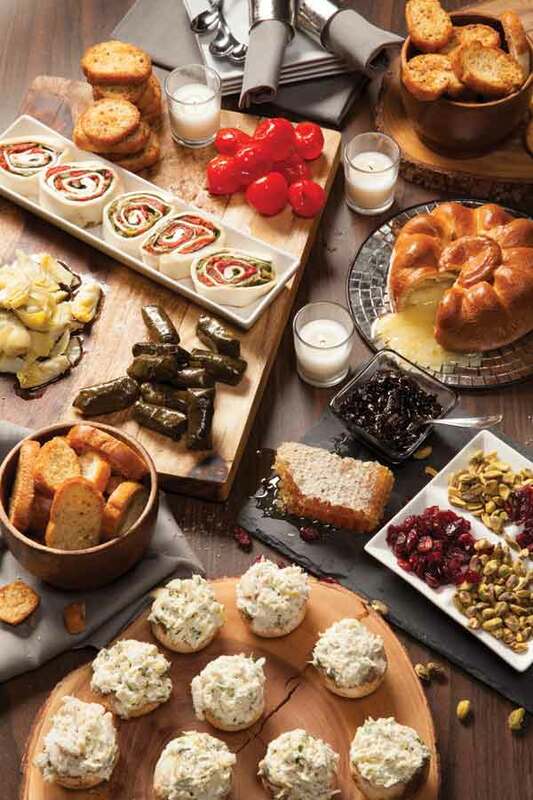 Finish off this bountiful spread with a few perfect bites: Dungeness crab–stuffed wild mushrooms ($12.99/pound), hand-stretched rotelle di mozzarella (cheese pinwheels) with mortadella and green olives ($14.99/pound), plus fresh dolmas, marinated artichoke quarters and Peppadew peppers from the olive bar (all $9.99/pound), and garlic crostini ($3.99/approximately 20 per bag). See also: Home Remedy (downtown, 2121 Sixth Ave.; 206.812.8407; tdhomeremedy.com) for favorite Tom Douglas bites, ranging from Lola’s tzatziki sauce to the pimento cheese spread made famous by Brave Horse Tavern. Holiday entertaining is stressful enough. Questions abound: Should we use the holly tablecloth or the reindeer placemats? Is Uncle Bruce going to crack that inappropriate joke again? Am I going to be able to button this sport coat if I have another helping of prime rib? But wine shouldn’t be on your list of anxiety-inducers. Seattle magazine wine writer Paul Zitarelli offers five versatile bottles to meet all your culinary challenges and wow wine novices and geeks alike. Wines from this sparkling-wine specialist have been served at dignitary dinners, so we figure the sparking Chardonnay is good enough for us. Look for stone fruits (peaches, nectarines) and tropical fruits (pineapple, papaya) carried on a wave of fine, creamy bubbles. Some of Washington’s most successful white wines come from these blends of traditional white Bordeaux varieties, and Buty’s version is among the very best, with enough rich, figgy fruit to work as a cocktail wine and enough key-limey acidity to cut through many a holiday dish. The elegant, bright red fruit is an easy match for a broad range of foods, but this has sneaky richness, too, enough to make it a pleasure to sip on its own. A blend of 33 percent Cabernet Franc, 29 percent Cabernet Sauvignon, 29 percent Merlot and 9 percent Petit Verdot, this wine has the versatility needed for holiday dinners. Cab Franc’s alluring mix of earth and flower is on fine display here, paired to delicious red cherry and red currant fruit. Opulento is as close to a legitimate ruby port as you’re going to find in Washington. Made from Portuguese indigenous varietals and fortified with 190-proof brandy, the inky-dark dessert wine is a total glass-stainer, offering a luscious mix of fruit (citrus peel, fig, dried cherry) and barrel (mocha, cocoa powder). It is the perfect way to end a meal (especially if there’s a cheese plate nearby) and send your guests into dreamland. Online wine retailer Full Pull Wines (SoDo, 3933 First Ave. S; 206.420.2168; fullpullwines.com), owned by Seattle mag’s Paul Zitarelli, normally limits its hours to Thursdays for list members only. 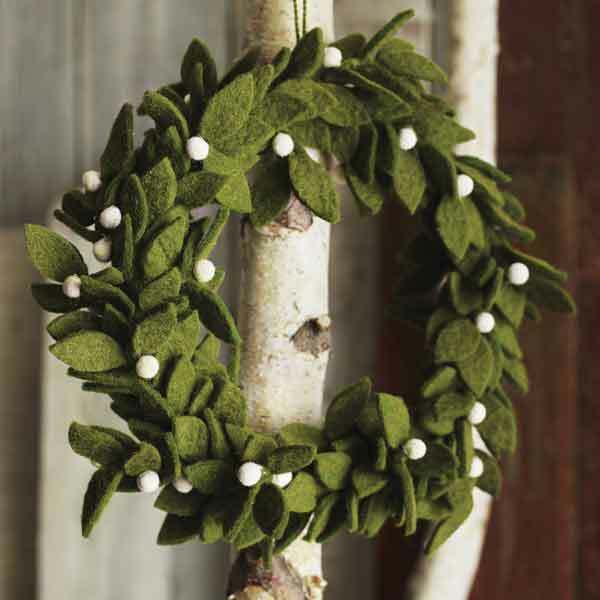 But around the holidays, the shop offers special hours for list members and the public alike. On the Saturdays before Thanksgiving and Christmas (November 22 and December 20, 10 a.m.–2 p.m.), Full Pull will have sparkling wine, dessert wine and/or big winter reds open to taste and for last-minute purchase. With winery neighbors Kerloo Cellars and Scarborough Winery also open on Saturdays, and brewery neighbor Schooner Exact pouring their own holiday specials, you can cover all your holiday booze needs in one trip. This year, invite guests to belly up to the pretzel bar: Kid-friendly, vegetarian and a total crowd-pleaser, this ingenious spread from Cameron Catering (4216 Sixth Ave. NW; 206.781.8149; cameroncatering.com) features freshly baked pretzel knots and a host of dips, from herbed horseradish aioli to classic stone-ground mustard to pimiento cheese sauce. 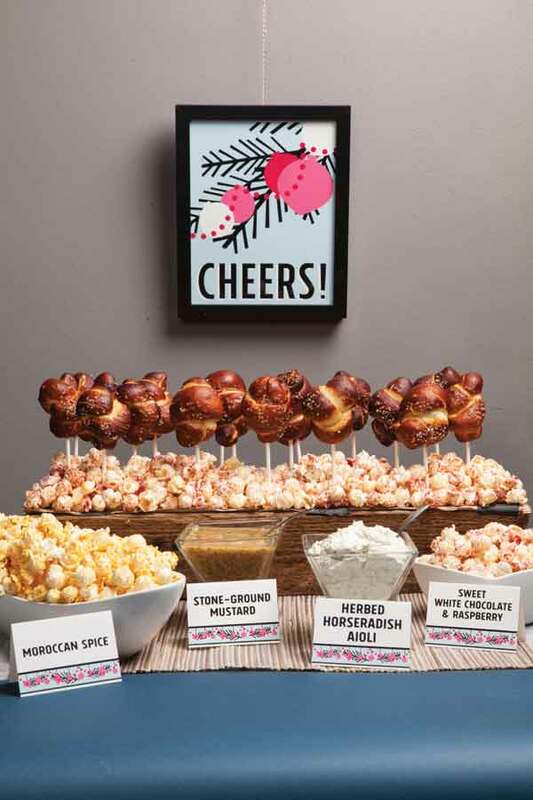 For the holidays, owner Suzanne Cameron is incorporating popcorn into the mix, coated in flavors such as Moroccan spice (cumin, coriander and smoked paprika) or sweet white chocolate and raspberry. Leave the legwork to her team, or order a simpler setup for pickup at the caterer’s Fremont shop. See also: For more ever-creative, ever-appetizing options, try the stellar crews at Lisa Dupar (duparandcompany.com), Herban Feast (herbanfeast.com) or City Catering (citycateringcompany.com). See also: The woodsy, rustic and oh so Northwest-chic options at Fleurt (West Seattle, 4536 California Ave. SW; 206.937.1103; fleurtseattle.com) or Lucca Great Finds (Ballard, 5332 Ballard Ave. NW; 206.782.7337; luccagreatfinds.com). Save a few precious shopping hours by turning your baking over to Alison Soike, owner of Alison’s Coastal Cafe & Bakery (Ballard, 5404 Leary Ave. NW; 206.322.5028; alisonscoastalcafeandbakery.com). In addition to serving a full breakfast and lunch, Soike fills her large display case daily with classic home-style treats, such as banana bread, chocolate-chip cookies and cinnamon rolls, alongside seasonal best-sellers such as salted caramels, peanut butter balls, toffee, old-school Chex mix and decadent chocolate whoopie pies filled with light, airy peppermint icing (treats average $1.25–$2 each). Add a personal touch by packaging these goodies in a cellophane bag fixed with candy-cane baker’s string. 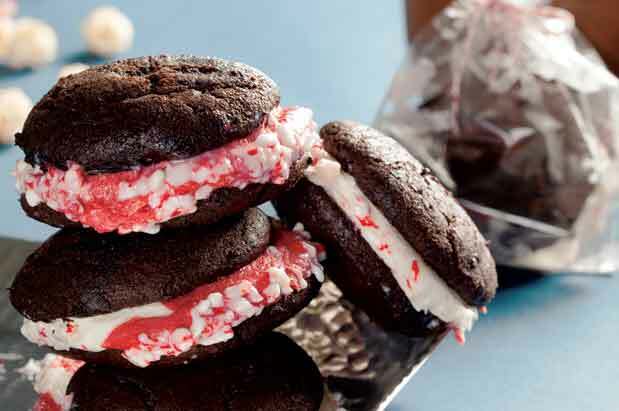 Or, let Soike be your savior here, too: With a collection of vintage holiday tins and sweet tags at her disposal, the cheerful baker will package up four perfect whoopie pies for just $6.50—in no time flat. See also: The new Thumbprints Baking Co. (online only; thumbprintsbakingco.com) for butter pecan thumbprints topped with ganache, and raspberry polenta sandwich. cookies from sisters Katie Arceo and Maggie Cheung. Game of Tag A little guidance goes a long way when explaining what’s in bottles, tins and on the party table to guests. Daria Penta of Ballard-based Hey Hooray party printables and event design (heyhooray.com) makes labeling easy with this colorful signage, designed for Seattle magazine. Download the bottle tags, party favor tags, menu cards, tent cards, 8x10 frameable wall decor and the 5x7 frameable wall decor. Having visitors this holiday who like a good drink? Luckily, we have the finest craft-distillery landscape in the whole country, making a distillery tour or a few individual distillery stops a fascinating and festive thing to do during the holiday season. On the Eastside, Woodinville Whiskey Co. (14509 Woodinville-Redmond Road NE, Woodinville; 425.486.1199; woodinvillewhiskeyco.com) has been making deliciously sippable bourbons and ryes for a few years, most recently in a newish, rustically beautiful distillery space, with lots of wood surrounding 1 ton of copper and stainless steel. In the Interbay neighborhood sits the few-frills Sound Spirits (1630 15th Ave. W; 206.651.5166; drinksoundspirits.com). This, the first craft distillery in the Seattle city limits since Prohibition, delivers a wide array of spirits and liqueurs made lovingly, one batch at a time, including the award-winning Ebb + Flow gin and the Depth Cacao, which features fair-trade organic cacao nibs from Theo Chocolate. Southern suburbanites are lucky to have Sidetrack Distillery (Kent, 27010 78th Ave. S; 206.963.5079; sidetrackdistillery.com) in their neck of the woods. All of Sidetrack’s spirits, produced on a farm in a bit of a hidden valley in Kent, are based on items grown within feet of the distillery. The results include a range of luscious fruit liqueurs, the earthy Bete (made from beets!) and a lemon verbena liqueur, which must be tasted to be believed. See also: Westland Distillery in SoDo (westlanddistillery.com) for world-class single-malt whiskey, and Seattle Distilling on Vashon Island (seattledistilling.com) for its line of hand-crafted spirited delights, including the best coffee liqueur in the state.